As noted before, the new GT-R lap time of the Nurburgring is 7’38’’. The suspension rigidity has been perfectly improved. 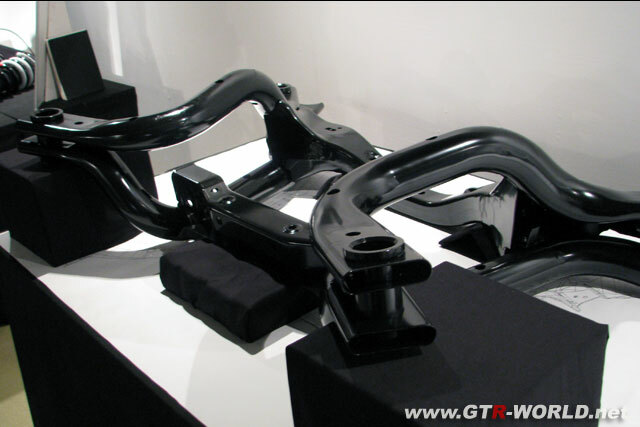 The front suspension member is one-piece with the pipe, which is a measure for improving the rigidity. There are six joining with the body. The rear suspension member is also one-piece with the pipe, and there are also six joining. It is like the suspension member of the racing car. The mount type of the steering rack has been greatly changed, and apparently has more rigidity. It makes us expect that operation by the millimeter may be possible. 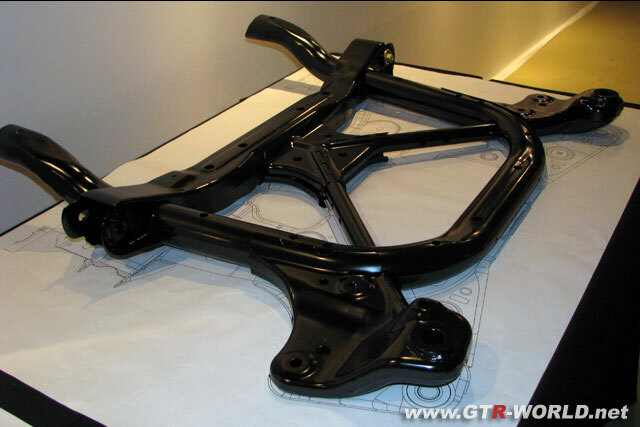 Also, the rear suspension link partly adopts the pillow-ball for improving the lateral rigidity and more smooth movement. Is the damper the bane of manufacturer? 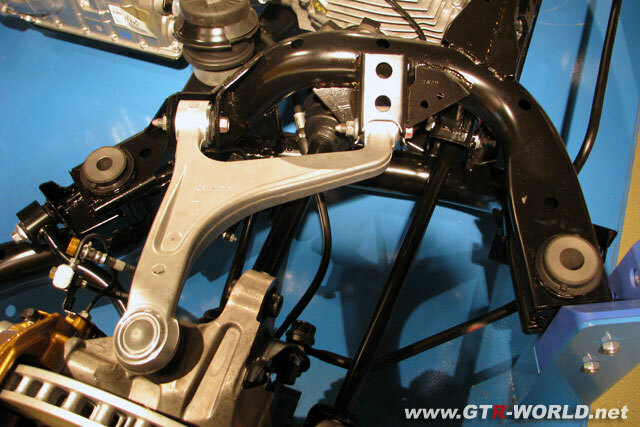 About the front damper unit, the leg-figured bracket is interesting. According to Mr. Mizuno, the input per two wheels is estimated about 5t. Therefore, securing the strength of this part should be important. For this reason, this bracket is made by the cold-forging method which costs a lot. When the aftermarket damper manufacturers attempt to make it, it is highly likely that this bracket will be a major bottleneck. On the other hand, the rear unit is shaped regularly. The front and rear springs seem to have the high rate of spring. 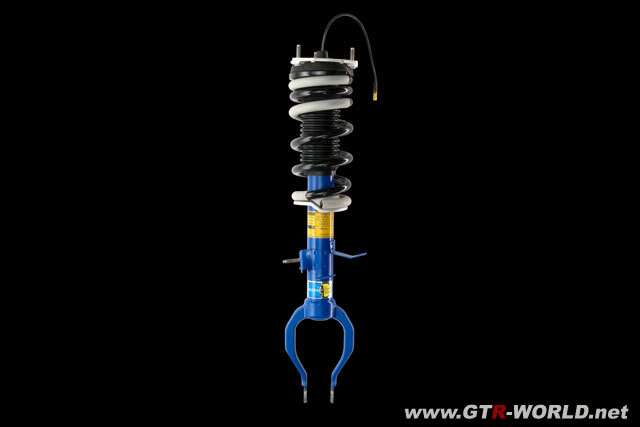 They are like the reinforced springs which used to be familiar a little while ago. When the damper manufacturing is found difficult, it is likely that many will adopt the higher rate of spring and reduce the road clearance. However, on the condition of 1G, the buffer clearance ( the stroke to the bump rubber on the shrinkage side) should be between 10mm and 15mm. In fact, when you reduce the road clearance by more than 10mm, the body keeps touching with the bump rubber, which deteriorates ride comfort and steering stability. You can cut the bump rubber or replace it with the shorter one, but you must remember that the bump rubber is equipped to be loaded 2t. Therefore, it must be the valuably expensive on with a nonlinear rate. 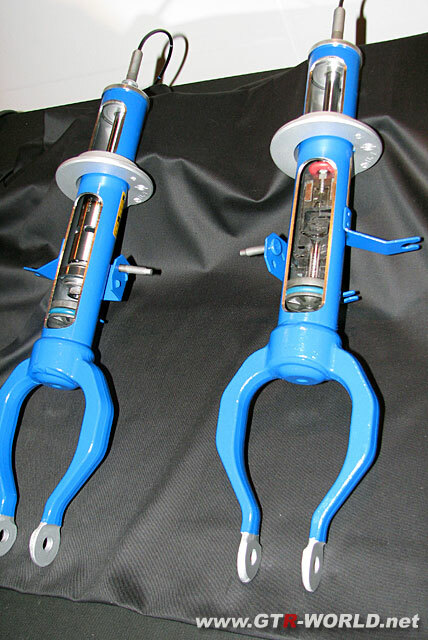 The shock absorber itself is a single cylinder structure and does not have ｒeservoir tank. It electronically controls the damping force. 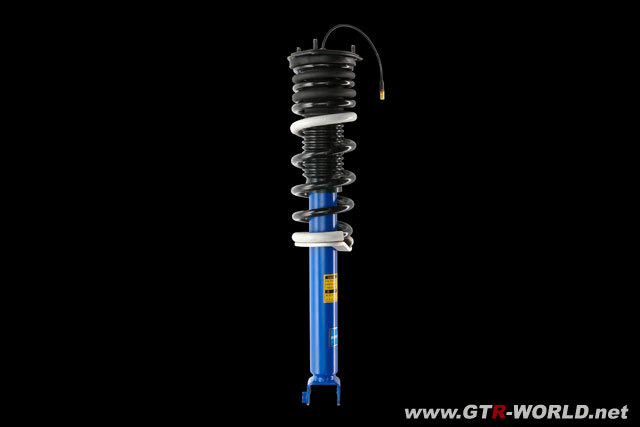 This was developed in cooperation with Bilstein. It is the heart of active suspension. The system is electronically controlled actively according to the various vehicle data of speed, front and rear G, lateral G, vertical G and other factors. According to the Development staff, changing spring rate affects bumping, rebounding and stroke information to the active suspention's control unit, and as a result of this, active suspension will not work properly. It will destroy the balance of vehicle dynamics. In any case, the suspension tuning is found difficult at this stage. Regardless of whether it is possible or not, there is the alternative of making the tuning with the active control incorporated, or giving up the active control for the rigid tuning.